If you find yourself in possession of a less than desirable dresser, or a dresser that you don’t necessarily need, think about repurposing it! Dressers can be transformed and repurposed in many different ways, and can be used for much more than holding your socks and t-shirts. To help start thinking outside-the-box, I’ve gathered ideas for twelve different ways you can repurpose your dresser. 1. Turn a dresser into a bookshelf. Remove the drawers, add plywood or MDF to create shelves where needed, and you have a cute little bookshelf. You can keep one or two of the drawers, or remove all of the drawers to create more shelves depending on your need. Dresser turned bookshelf from The Inadvertent Farmer. 2. Turn a dresser into an entryway table (or sofa table). If you’re not afraid of a few power tools, you can transform a dresser into a leggy entryway table or sofa table. Dresser turned into a leggy entryway table, from Show & Tell. 3. Turn a dresser into a bathroom vanity. 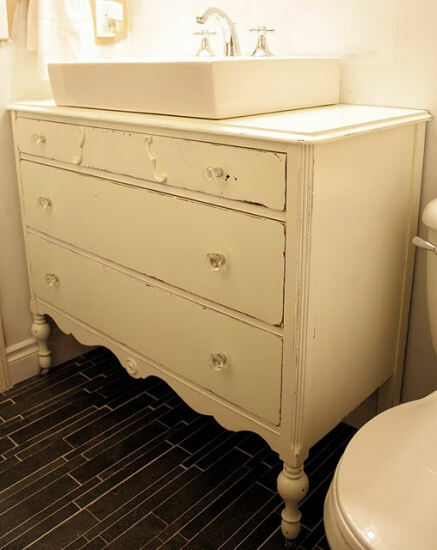 If you’re tired of your plain builder-grade bathroom vanity, add character to your bathroom by searching Craigslist, garage sales, and flea markets for an antique dresser. Cut a hole for the sink, re-work the top drawers and the back panel to make room for the plumbing, and you’re well on your way to a custom look for your bathroom. Antique dresser turned into a bathroom vanity, from Paint The Roses White. 4. Turn a dresser into a bench. Remove the top of the dresser and the top drawers, and what do you have? A bench, of course! Add some plywood for a seat, a comfy cushion, and you’ve got extra seating for your entryway, front porch, or mud room. The remaining drawer on the bottom is a bonus…seating with storage. Dresser turned into a bench, from My Repurposed Life. 5. 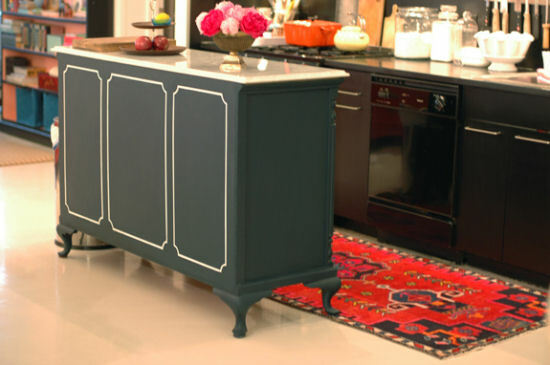 Turn a dresser into a kitchen island. Replace the top of your dresser with marble, granite, or butcherblock, and you have a unique kitchen island with storage. Just keep in mind that the back will show, so be sure to pretty it up with some paint and other details. Dresser turned into a kitchen island, from Little Green Notebook. 6. 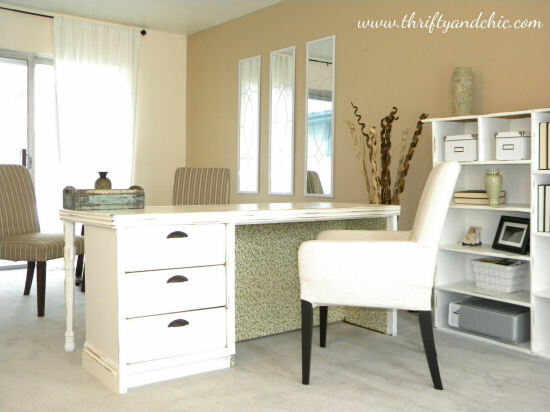 Turn a dresser into a desk. If you’ve got power tool experience, this might be just the challenge you’re looking for. Remove a few drawers and the bottom support on one side of the dresser, and you’ve got a desk. It’ll take a bit of finish work to get it from “dresser with a big hole in it” to “pretty and stylish desk”, but that’s part of the fun! Dresser turned into a desk, from Thrifty & Chic. 7. Turn a dresser into a garden potting bench. A dresser gives you plenty of storage for your gardening tools. Remove a drawer or two to create shelves for your pots and potting soil. You can even tile the top to make it more durable. Of course, it would be better to keep it in a garage or a covered porch, but if you’d like to keep it outside, simply paint it with exterior paint for maximum durability. 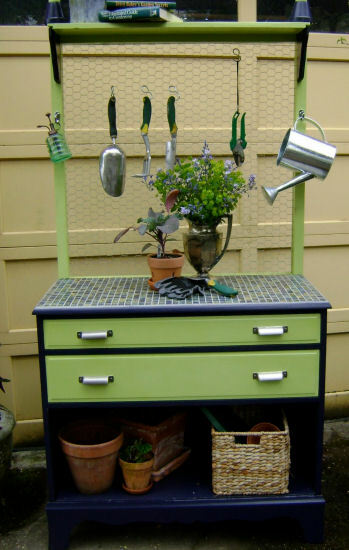 Dresser turned into a garden potting bench, from Jarden Designs. 8. 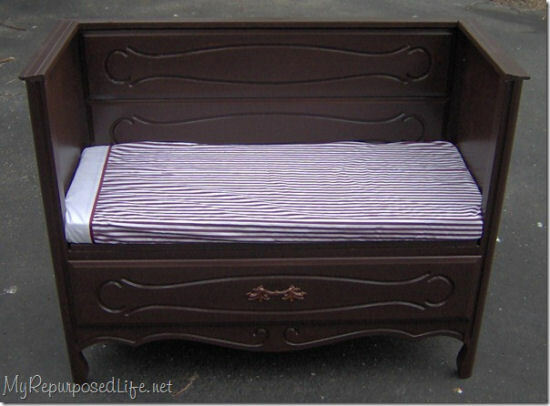 Turn a dresser into a baby changing table. No tools and no assembly required. Simply paint the dresser any color you like, and add a cushy pad on top to create a changing table (and later, just a dresser once more) that your little one can use for years beyond his diaper days. 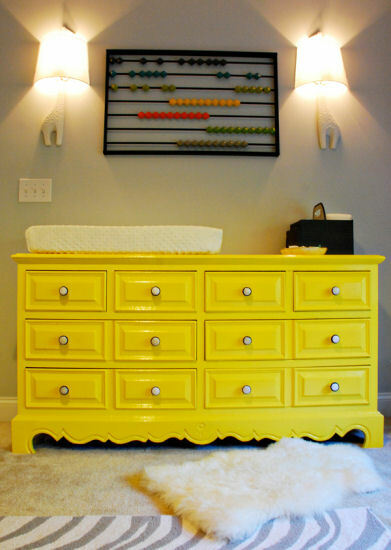 Dresser used as a baby changing table, from Honey & Fitz. 9. Turn a dresser into labeled basket storage. 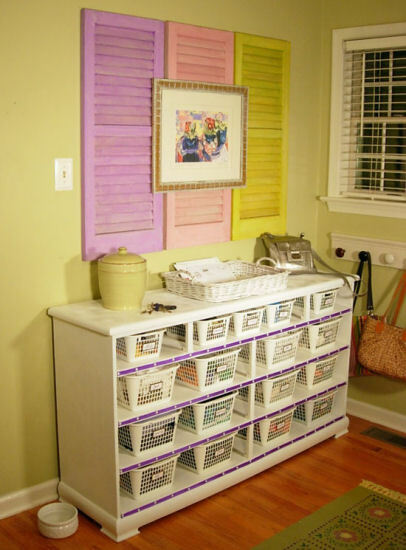 This idea is great for a craft room, sewing room, or mud room. Simply remove the drawers and replace with smaller baskets. Label your baskets for maximum organization, or use clear plastic containers to eliminate guess work. Dresser transformed into labeled basket storage, from In My Own Style. 10. Turn a dresser into a garden planter box or container garden. If you live somewhere with limited outdoor space, you can turn a dresser into a planter box or container garden. Just cut a hole in the top to plant your veggies or flowers in the top drawers, and then open the middle and bottom drawers so that they’re staggered for more planting space. 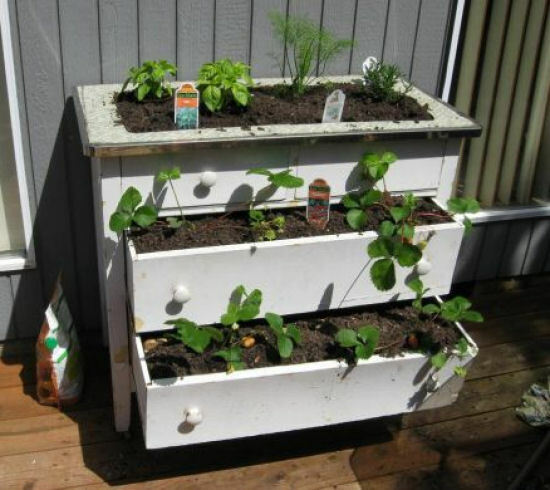 Dresser turned into a planter box or container garden, from Hubpages. 11. Turn a dresser into a television console. Dressers can be the perfect size and height for a flat screen television console. 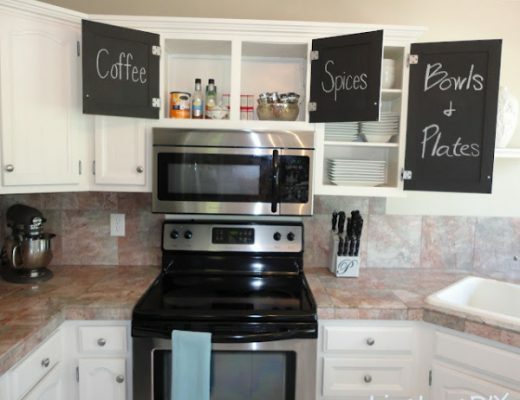 Remove the top drawers and create shelves for DVD players, gaming systems, DVRs, and other electronic devices. 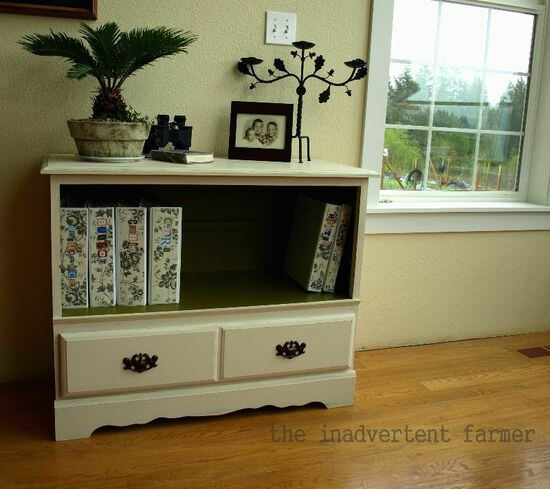 Dresser turned into a flat screen television console, a DIY project from right here on Addicted 2 Decorating. 12. 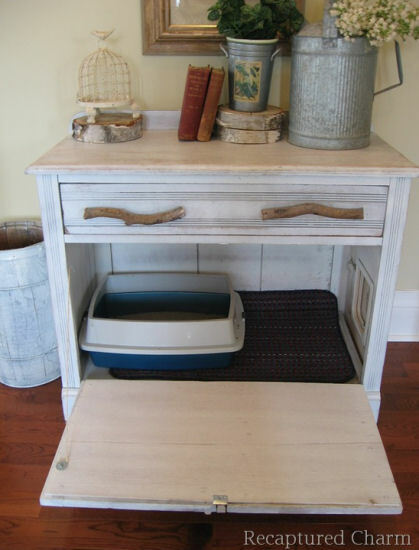 Turn a dresser into a cat litter box container. If you have cats in your home, you know how challenging it can be to find an out-of-the-way place for the litter box, especially if you happen to live somewhere without a utility room. A great solution is to take something that looks pretty–a dresser–and turn it into a hiding place for the litter box, with side entry for your feline to access the loo. Dresser turned into a cat litter box container, from Recaptured Charm. Cool. Giving me some ideas to think about…I can do these too! I have a question and I’m sure you can answer it very quickly. I have a dinning room set that has that slick Formica like top on it, but the rest of the pieces and legs are wood. Is there a product that allows you to “paint” transform the top? You could prime it first with Zinsser Cover Stain primer (I would suggest oil-based) and then paint it any color you like. Do you have any ideas in converting a dresser to a bar with wine rack and storage for drink glasses and liquor storage? Want to put my dresser in my new very large closet. I would like to put it in the center like an island. Do you have ideas as to what I can do to the back of it? Put waynecotting on it . Use a wood glue to apply it. 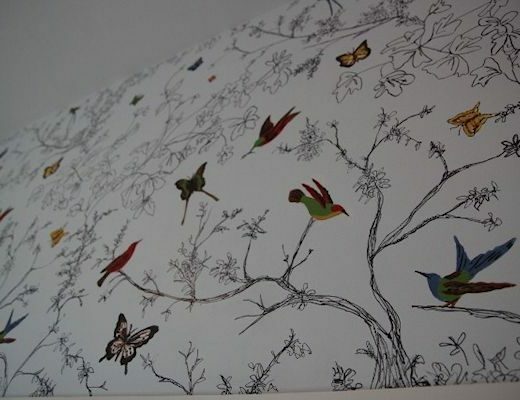 Can be painted over. I love all your very creative ideas – they certainly get my imagination working on what I can do with bits of furniture in my house. Thank You! Turn An Old Dresser Into A Bench And More! 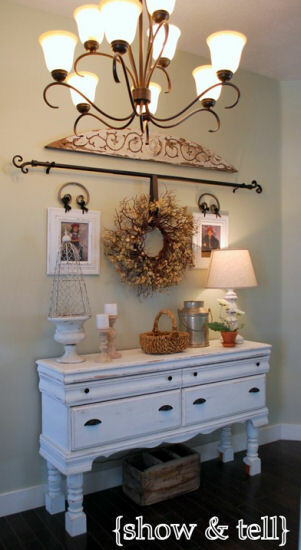 12 Clever Ways To Repurpose A Dresser! Oh my goodness, I just discovered your blog and cannot believe it. You expressed what I have been feeling all my adult life. I live and breath decorating. I drive people crazy with my obsession and that is what it is to me. I thought I was reading about myself in your profile. Looking at your pics, I see that we have about the same taste to. I have always wanted to be a decorator, even took classes but never felt that I have what it takes to be great at it. How did you start your business without getting a degree in decorating??? I took classes, but never took my final……a long story. I love what you’ve done so far and look forward to seeing more!!!! It’s not really possible to answer that without seeing the dresser. 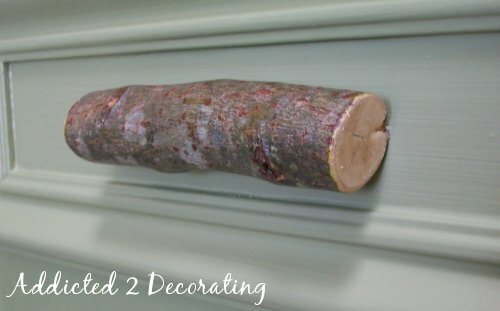 Not sure how to upload pictures in the comment box (using my cell phone) to show you what I’m talking about.some dressers usually have metal track rolls for the dresser draws to roll on when being inserted and some has wood. Any metal pieces attached to wood are usually attached with screws. You’ll just have to search for the screws, and use a screwdriver to take them out. They might also be glued, so you’ll have to use a bit of muscle (or a hammer) to get them out. Such good ideas! Love the litter dresser! Thanks. Can I ask what the measurements are on this dresser? Thanks!! !